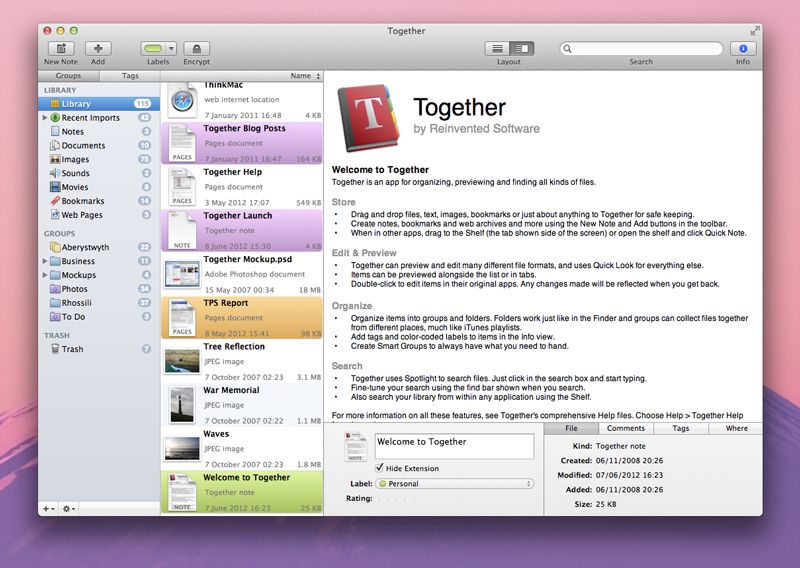 [prMac.com] Swansea, UK - Reinvented Software announced the release of Together 2.1 for Mac OS X Leopard today. Together is a file organization application for storing, previewing, editing and searching all kinds of files. Version 2.1 introduces many new features such as .Mac sync, Favorites and Quick Look previews for its Shelf, saving web pages as PDFs and AppleScript support, plus improvements for Smart Groups, tagging, Spotlight integration, importing and a more customizable user interface. Together 2.1 can now sync with .Mac, allowing members to access their library on multiple Macs. Together's Shelf, a system-wide library browser that lives on the side of the screen, includes a new Favorites section for quick access to items and can now show Quick Look previews of items. Together's innovative tag browser includes more control for system tags and the Library can be customized with a choice of icons sizes for items and groups and custom group icons. Version 2.1 makes importing easier with a global import hot key and web browser bookmarklets, and it can import tags from files' Spotlight comments. Also, Together can now show options when importing, so items can be tagged, rated, and labeled without leaving the current application. Together can edit or preview many different file formats, include text documents, PDF files, images, movies, web archives and bookmarks, and will use Quick Look to generate previews for everything else. Version 2.1 adds the ability to generate PDF files from web pages which, unlike those created through printing, retain the original page's appearance with background images and no pagination.